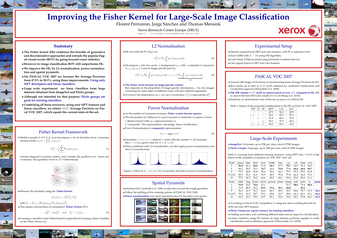 Abstract : The Fisher kernel (FK) is a generic framework which combines the benefits of generative and discriminative approaches. In the context of image classification the FK was shown to extend the popular bag-of-visual-words (BOV) by going beyond count statistics. However, in practice, this enriched representation has not yet shown its superiority over the BOV. In the first part we show that with several well-motivated modifications over the original framework we can boost the accuracy of the FK. On PASCAL VOC 2007 we increase the Average Precision (AP) from 47.9% to 58.3%. Similarly, we demonstrate state-of-the-art accuracy on CalTech 256. A major advantage is that these results are obtained using only SIFT descriptors and costless linear classifiers. Equipped with this representation, we can now explore image classification on a larger scale. In the second part, as an application, we compare two abundant resources of labeled images to learn classifiers: ImageNet and Flickr groups. In an evaluation involving hundreds of thousands of training images we show that classifiers learned on Flickr groups perform surprisingly well (although they were not intended for this purpose) and that they can complement classifiers learned on more carefully annotated datasets.